Summer Garden Buildings - Who Has The Best? 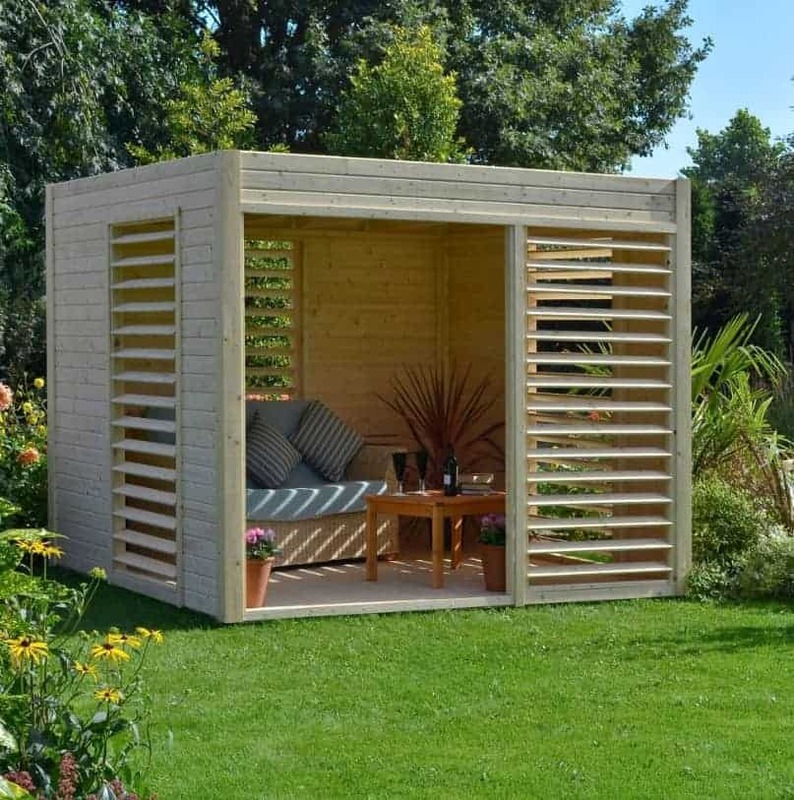 Summer garden buildings help you make the most of beautiful sunny days, whenever they occur, and the best examples of them can also be an attractive feature to brighten up your garden space. 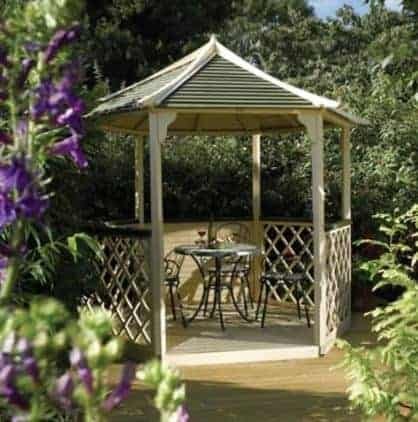 There are a wide range of summer garden buildings available today, from arbours and arches, to pergolas, canopies, shelters and gazebos, so finding the one that’s ideal for your particular garden can seem a little daunting. That’s why WhatShed have created this helpful guide to the 20 best summer garden buildings that are available to buy online in the UK today. Compiling this list of the top 20 summer garden buildings currently available was not an easy task, particularly because of the diversity of buildings and structures contained within it. By looking at comparative value for money, design and build quality, durability, and aesthetic appeal, however, we were able to create a league table that we feel will be handy for people buying summer garden buildings of any kind. 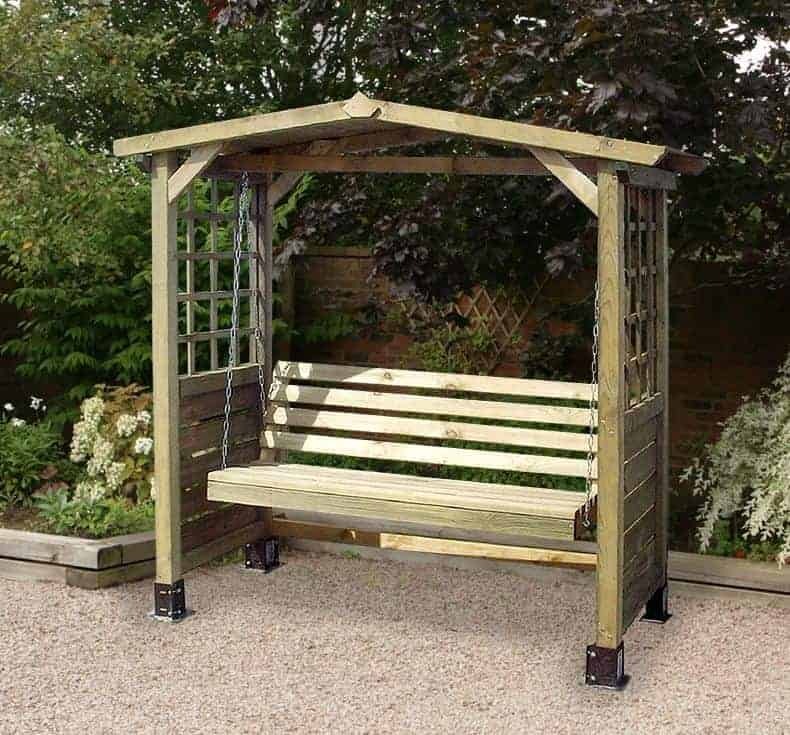 Congratulations, then, go to the Store More Poseidon arbor with swing seat, which tops our list of the very best summer garden buildings that can be bough online in the UK today thanks to its fun and highly useful design, it’s durability, and its outstanding value for money. Of course if you’re looking for pergolas or gazebos or shelters you will need to look a little further down our league table, but you can be assured that all the summer garden buildings in this diverse top 20 list have something special to offer the consumer. Whatever kind of garden building you need, from small timber sheds to large metal greenhouses, WhatShed will continue to bring you the independent reviews that will help you make an ideal choice. 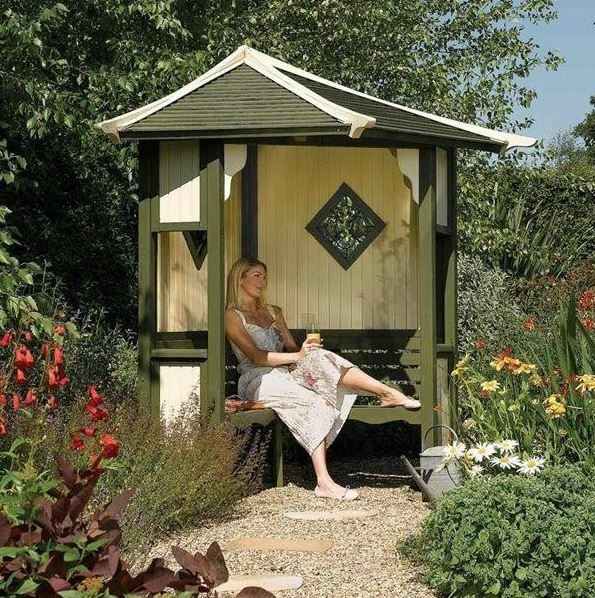 There are few things more relaxing on a warm day than sitting in an arbor and looking out at your beautiful garden, which is why they are one of the most popular summer garden buildings in the UK today. This model, however, takes the concept even further by adding a seat that swings rather than one you simply sit upon. 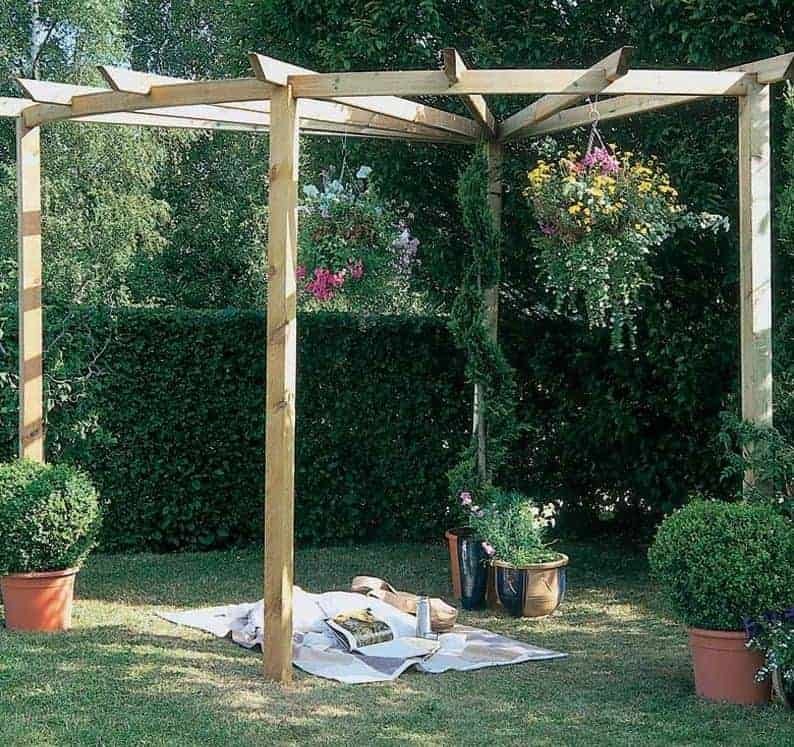 This makes the arbor even more fun, and even more relaxing, and as it also represents excellent value for money this is enough to take it to the very top of our list of today’s best summer garden buildings. We’ve reviewed lots of Store More garden sheds and always found them to be well built and durable, so we were pleased to see that they had extended this philosophy to their summer garden buildings as well. The arbor itself has a width of 1.78m and a depth of 0.80m, and the peak height achieved by its slatted apex roof is 1.95m. It’s ornately decorated with trellising, and the seat itself is easily enough to seat two people in perfect comfort and is held up by tough steel chains. What we liked most about this arbor, however, is that it has been pressure treated to give it long lasting protection against rot, and as a sign of this the manufacturer has been able to provide a 7 year manufacturer’s guarantee. When comparing a gazebo to an arbor there’s obviously going to be a significant difference in the purchase price, but as this well built gazebo shows that doesn’t mean that they too can’t offer exceptional value for money. It’s not the most attractive gazebo that we’ve seen, and in many ways is more of a shelter than the typical walled hexagonal buildings that people think of when they imagine a gazebo, and yet it is very large and very well built, and with an affordable price tag as well that is enough to carry it into second place in our list of the very best summer garden buildings available today. The first thing that struck us about this gazebo was the sheer scale of it, as it has a width of 4.90m and a depth of 3.00m. The apex style roof above it reaches up to a height of 2.70m, so there’s more than enough room to move around in, and we were pleased to see that it is covered with tough roofing felt, making it very good at carrying any rain that comes along away. 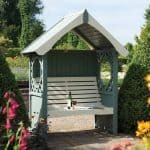 It’s an ideal cover for garden seating, for an outdoor dining set, or for a large barbecue, and its this versatility that makes it one of our favourite summer garden buildings. It’s also very durable as the timber has been pressure treated and comes with a 15 year guarantee, as long as any that we’ve seen on similar buildings. Garden shelters can be an ideal accompaniment to any garden in the summer, especially if you like to entertain guests. They make an ideal place to relax with a glass of something nice either before or after a dinner party, and allow you to look out at your garden whilst having shade from the sun, or protection against a summer shower or two. 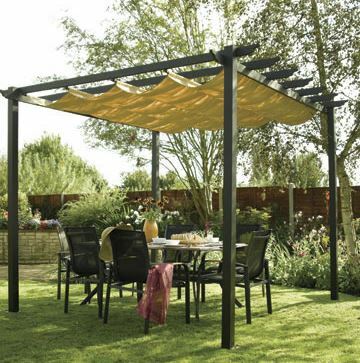 For those looking for a well built shelter, yet whose budget won’t stretch to the gazebo that features at number two on our list of the best summer garden buildings, this latino garden canopy could be a perfect solution. The frame itself is made of aluminium, so it’s very tough, durable and weather resistant, making it a virtually maintenance free purchase. 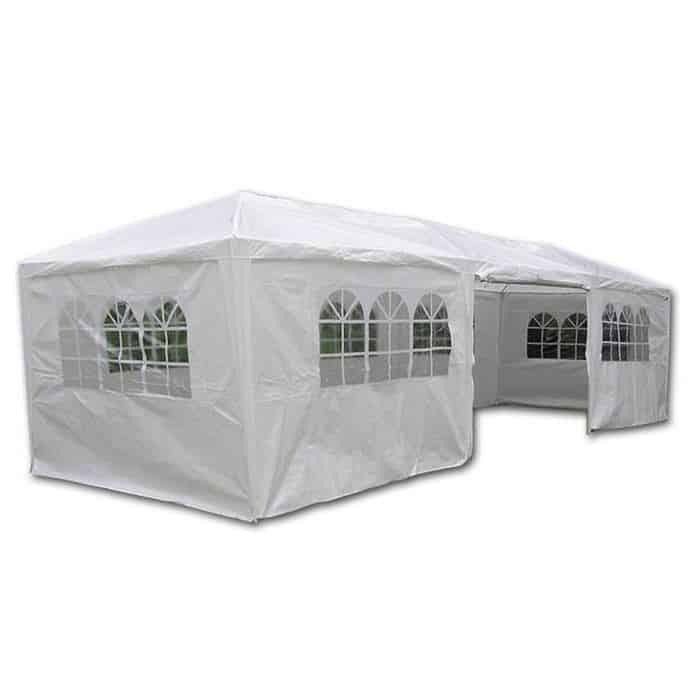 It has both a width and depth of 3.00m, and a height of 2.35m so there’s lots of room to entertain guests, while being protected by the canopy above. It’s this canopy that particularly impressed us, and which elevated this structure into our top three summer garden buildings. It has an attractive taupe colour, and can easily be retracted when not in use, or removed for cleaning purposes. It’ made of tough polyester that’s then been powder coated, so you won’t need to worry about the colour fading, or rain getting through. An attractive arbour is not only a great place to sit down on a summer day, it’s also a garden feature in its own right and one that enhances the look of your landscape as a whole. 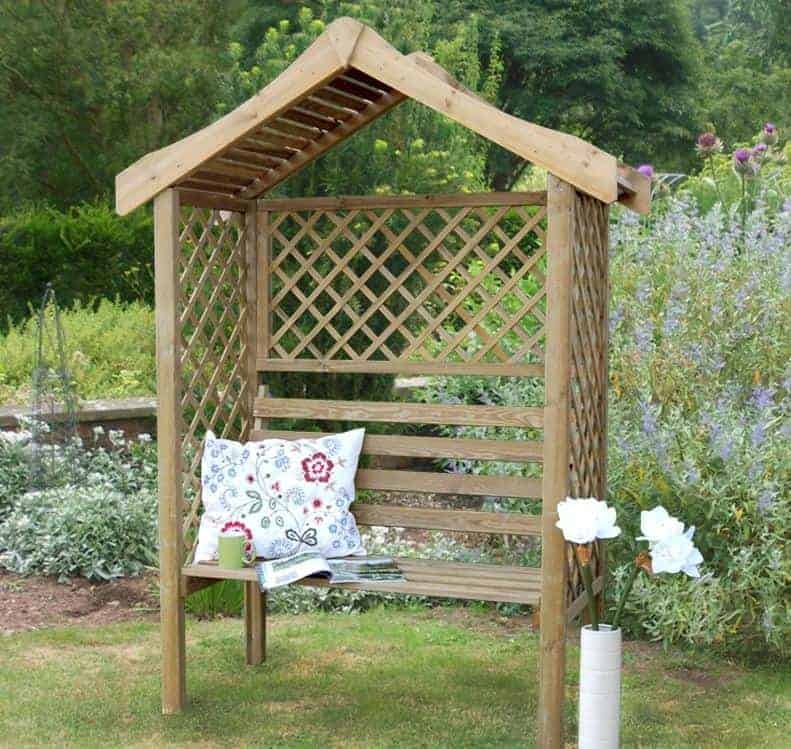 That’s why we rate this visually striking arbour so highly, and with its more than accommodating size and price tag it fully deserves its place in our top five summer garden buildings that can be purchased online in the UK today. We have reviewed cheaper arbours, of course, but not that are as spacious and as good looking for an asking price of less than a hundred and fifty pounds. It has a width of 2.1m, so there’s more than enough room for two people to sit side by side in complete comfort, and above them the apex roof rises up to 2.12m. Slow grown timbers have been used, which makes them strong and very weather resistant, and this has been enhanced by a pressure treatment which means that it comes with a 15 year guarantee against wet rot. We feel that this is very generous for such affordable summer garden buildings, and it should give the customer real peace of mind. We also liked the way that the attractive trellised panels are pre-built, so the assembly process is both quick and easy. There are many attractive structures in our league table of the 20 best summer garden buildings, which is hardly surprising as more than any other garden building they are prized for their form as well as their functionality. This pagoda is undoubtedly the most original and eye catching summer garden building we’ve seen, and even though the price tag may put it out of the reach of some budgets, we feel it’s deserving of its fifth position in our list. This very well fabricated timber building will give any garden a touch of the orient, and yet we found that it looks very classy and elegant. It’s sure to become a much talked about, and much loved, garden feature, and we were also impressed by how practical it is. With a base size of 2.58 x 2.29m and a height of 3.32m it’s one of the larger summer garden buildings in our league table, making it an ideal and shaded position to stand in the garden. Alternatively, there’s enough room for garden furniture to be added underneath the protection of the pagoda’s roof, making it a perfect place to have breakfast on a warm day. With an initial pressure treatment applied and a 10 year warranty in place, this is a unique garden building with a lot to recommend it. When summer arrives, there’s one thing that the mind of most people in the UK turns to: a barbecue. Al fresco cooking is lots of fun, and the results can taste great as well. A well built barbecue shelter such as this one can make the process even more enjoyable, and that’s why this contemporary styled shelter has obtained such a high position in our list of today’s 20 best summer garden buildings that can be bought online. What we liked most about this particular barbecue shelter is its sheer scale for a price of less than seven hundred pounds. Its rectangular shape covers a base area of 3.45 x 2.37m and the roof of the shelter is at a height of 2.30m. At the centre of this roof is a polycarbonate sheet that prevents rain hitting the barbecue underneath, and it’s also tinted to give protection against the UV in sunlight. The rest of the roof consists of slatted timber panels, and there are both slatted and solid sections of the walls below. We found the end result very attractive, and with all the timbers being pressure treated and protected by a 10 year anti-rot guarantee, this is also one of the best value summer garden buildings we’ve reviewed. 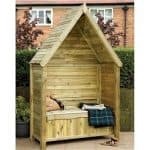 Of course, it’s not only suitable for barbecues, as this can be used as an all weather shelter that enhances any garden activity. 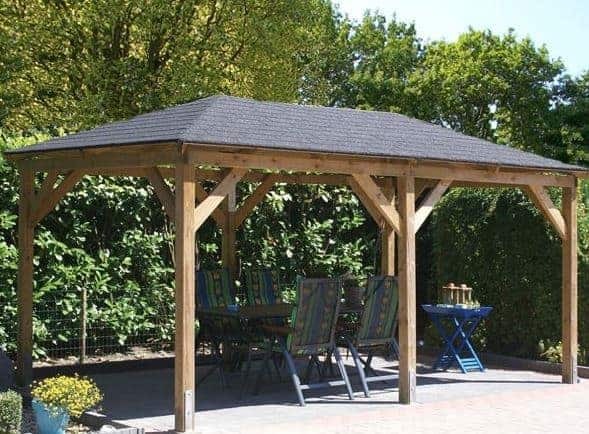 Having a well sized timber gazebo can bring a lot of benefits to a garden: they provide a shaded place to relax out of the sun as well as a place to take shelter from rain while you’re doing gardening tasks, and they can also be an attractive way to enhance your garden as well as an outdoor space under which you can entertain house guests. The price can sometimes put people off purchasing one however, so we were pleased to see that this excellent gazebo cost significantly less than a thousand pounds. It’s this great value for money that takes this very useful structure into the top half of our top 20 summer garden buildings. The base size is 3.40 x 3.40m, and the peak height of the apex roof is 3.00m. There are no walls around the four strong supporting posts, but this in itself makes it easy to move or carry things in and out. The overall look is pleasing on the eye, and this can be enhanced still further with the addition of roof shingles that can be purchased as an optional extra at the same time as the gazebo. Even so, there are more attractive summer garden buildings in our league table, but this should still be considered by those looking for a budget priced yet reliable wooden gazebo. 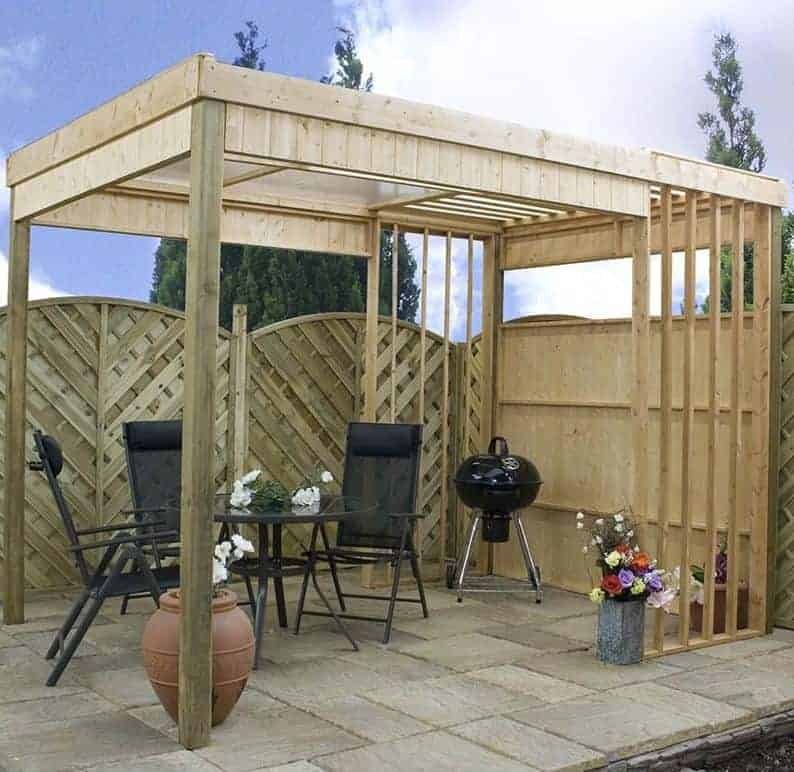 This is one of the more versatile low-cost summer garden buildings in our league table, as it combines both an arbour and a barbecue shelter. Stylistically it follows an arbour design with a width of 1.82m and a depth of 0.74m, with the apex roof above it having a ridge height of 2.63m. Both the roof and the three walls that lead to the open front are slatted, and we feel this will look even more attractive when painted or stained. One thing that makes this different from a standard arbour is that there is no integrated seat, this allowing a barbecue to be placed in the available space. It would be easy to add a garden seat or bench to this area however, if you wanted to use it primarily as an attractive wooden arbour. The slatted roof has been designed to create a filter effect to carry smoke from a barbecue away and the elevated ridge above it acts as a kind of chimney. The hand rails along three sides are also wide enough to safely place cups, glasses, and plates, which we thought was a neat touch. Even more pleasing, the timber has been pressure treated, which brings with it a 15 year guarantee, and it is also fire retardant. Because of these features, this truly is one of the summer garden buildings which is dual functional. This is by far the least expensive gazebo on our list of the 20 best summer garden buildings, and with its traditional styling it’s highly attractive as well. It has a hexagonal design that we found very appealing, and its base area of 2.15 x 2.48m means that there’s more than enough room to fit a table and chairs inside, which makes it an ideal area to relax in your garden. It’s also very tall, with a peak height of 2.65m which adds to the overall feeling of comfort and space. 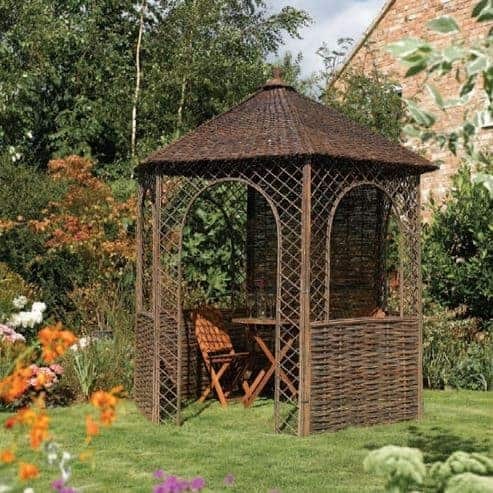 The reason that this gazebo is so affordable is that it is made not of timber but of willow. Nevertheless the structure feels solid and reliable when assembled, and it should also prove very weather resistant as long as a protective coating of linseed oil is applied to the substrate before it’s fitted together. We were pleased to see that, for those people who prefer wooden summer garden buildings, there are options to upgrade the flooring to pressure treated timber, but we liked the rustic appearance of the original version and at a price of not much more than three hundred pounds this six sided building has a lot to recommend it. As we’ve already seen, Rowlinson make a wide range of summer garden buildings that always deliver on quality, design, and innovation. This pavilion is another of their buildings that we were very impressed by, and it has a look of all of its very own that will make it stand out in a garden environment for all the right reasons. Even though it has a price tag in excess of twelve hundred pounds, it’s also remarkably spacious, and so deserves to take its place in the top half of our league table. It is rectangular in shape, with a base size of 2.64 x 2.56m, and what immediately caught our eye was the wide open front and slatted louvre cladding. That not only makes the interior very light but very airy too, which is why it’s a perfect place to spend time on a summer day or evening. In effect, this is like a summer house without the glazing, which means of course that it’s not as secure but it also means that it’s a safe environment for children to play in or around. This may not be one of the cheapest summer garden buildings we’ve reviewed but with a tongue and groove roof and floor, and a 10 year manufacturer’s warranty, it is both durable and versatile. There are few more attractive additions to a well maintained garden than trailing vines or climbing plants, and a pergola can help to show them off to their very finest. This is the first pergola to make our WhatShed guide to the best summer garden buildings which can be bought online in the UK today, and what makes it stand out from other pergolas we’ve reviewed is its high quality components, attractive design, and durability all allied to a good value asking price. We particularly liked the way that it has a quarter circle design, with the arms radiating out from the centre. This is not only attractive to look at in its own form, a value that will of course be enhanced when it has plants covering it, it also means that it will fit neatly into the corner of a garden. For that reason we feel it’s a perfect pergola for people who have a limited amount of lawn space to spare. That’s another reason that this joins the summer garden buildings that we regard as the very best, especially as the timber is slow grown for extra strength and has been pressure treated and so comes with a 15 year anti-rot guarantee supplied by the manufacturer. 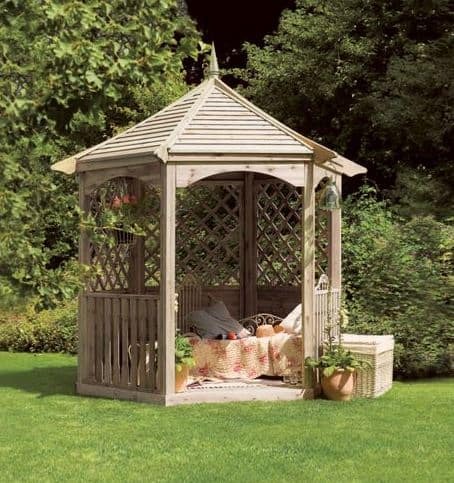 From the moment we saw this traditionally styled six sided gazebo, we were struck by its good looks and as it’s also available for a very reasonable price we have no hesitation in naming it one of our 20 favourite summer garden buildings on the market today. It features one open side for easy entrances and exits, one solid backed side, and then four sides where the timber is arranged into an attractive trellis effect. With the apex roof above it channeling any rainwater quickly away as well as providing cooling shade whenever needed, this is an ideal summer building whatever weather comes your way. The base area is 2.70 x 3.00m although of course the corners associated with a hexagonal building do mean that there is a little less interior space than these bare measurements imply. We were glad to see that all of the timber had been pressure treated, which isn’t something that we always find even on the more expensive summer garden buildings, but we would also have liked to see it come with an extended guarantee against rot as standard. The lack of such a guarantee is the only thing that presents this gazebo taking a place in the top half of our league table where it would otherwise reside. Gazebos are the ideal summer garden buildings for those who like to take their dinner parties outdoors during the warmer months, but of course the more guests that you entertain the larger the gazebo you need. This is one of the larger gazebos that we’ve reviewed at a price of under two thousand pounds, and whilst we’ve had to bear this elevated price tag in mind when determining its final position in our league table, it should certainly be considered by those whose budgets it falls within. It has eight sides rather than six, and this gives a base width of 3.94m and a base depth of 3.00m, which equates to almost nine feet by thirteen feet. The scale of the structure makes it seem even more attractive, thanks to its stylish mix of solid softwood panels and trellised panels. We were pleased to see that the timber used was sustainably sourced and pressure treated, and that it comes with a 10 year warranty even though this is dependent upon the customer carrying out annual retreatments with a high quality wood preserver. This, then, could be a perfect choice for those people who are wanting larger summer garden buildings to entertain their friends and relatives in. This is unique among the summer garden buildings featured in our top 20 league table in that it’s made of plastic rather than timber or aluminium, and so whilst it isn’t as stylish or attractive as the other structures it is very generously sized and very generously priced as well, which accounts for its position. The first thing we noticed once the structure was assembled was just how large it is, with a width of 8.84m and a depth of 3.05m, as well as a very useful height of 2.50m. This makes it ideal for entertaining large parties, which is why we can see it being used to celebrate landmark birthdays or anniversaries when lots of friends will gather. The walls themselves are made of white polyester, but we were pleased to see that they were supported by a powder coated white steel frame which makes the building a lot stronger and more stable than you might imagine. It was also good to see that eight translucent window panels had been integrated into the walls, so it’s very bright inside. 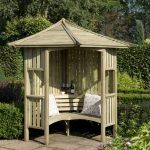 This will never be as classy as the timber summer garden buildings on our list, but for those who need a very large weather protected area that can be assembled quickly, this will prove hard to beat. 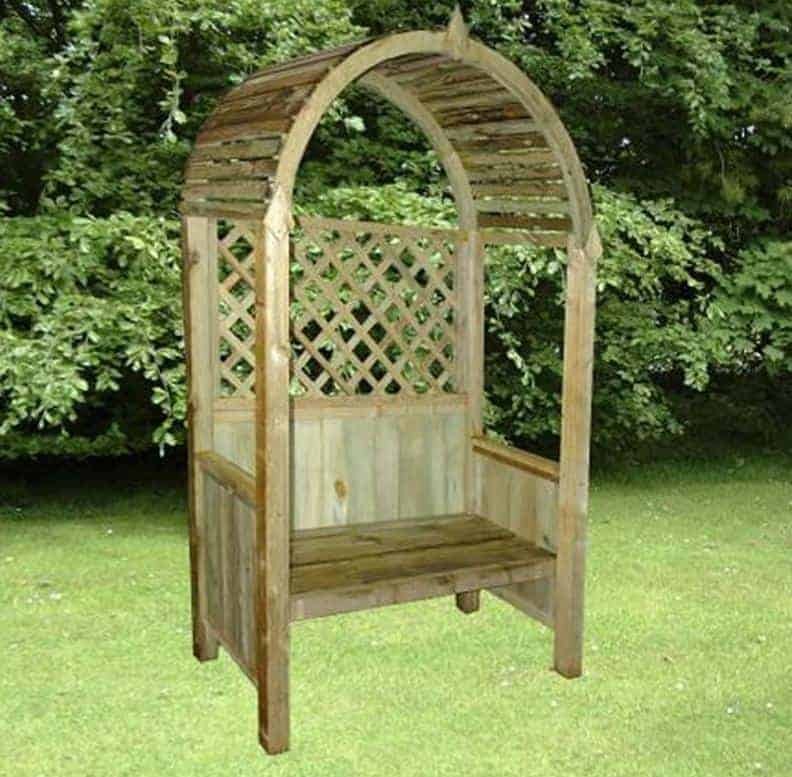 This high quality arbour is the cheapest of all the summer garden buildings on our list, and its winning combination of providing very good value for money as well as being an attractive addition to the garden accounts for its inclusion in our top 20. In an age when many modern arbours are being made from vinyl, it was good to see such a well priced arbour that follows a very traditional timber design, and as the timber has been pressure treated it also comes with a 7 year warranty against the appearance of wet rot, which isn’t something we would have expected from a garden building that costs only slightly over a hundred pounds. Both the integrated garden seat and the apex roof above it have a slatted effect, making it ideal for vines to twist around. It also means that any rainwater will simply run away rather than sitting on the surface. Another nice touch at this price is that the side panels have been given a trellised effect which shows that Store More have paid a laudatory attention to detail even in their cheapest summer garden buildings. If you want the advantages of a beautiful and yet compact arbour in your garden, but don’t want to spend too much in the process, this could be for you. This may be one of the smallest arbours to enter our league table of the best summer garden buildings that can be bought online today, but it’s very elegantly formed and this is just one of the elements that has earned it a place in our top 20. It has the curved roof that many people associate with a high quality and traditional arbour, and this not only looks good it’s also very effective at carrying rain and even snow away. We also liked the fact that the roof is slatted, which is ideal for those who plan on using their arbour as a structure to grow plants upon rather than simply a place to sit and relax in the garden. The seat itself is ideally suited to one person, with a width of 1.11m and a seat depth of 0.49m, but it was good to see that, in common with all the timbers used, it had been given an initial pressure treatment. That means that you won’t have to worry about wet rot taking hold, and we would expect it to last even longer than its 7 year warranty period. 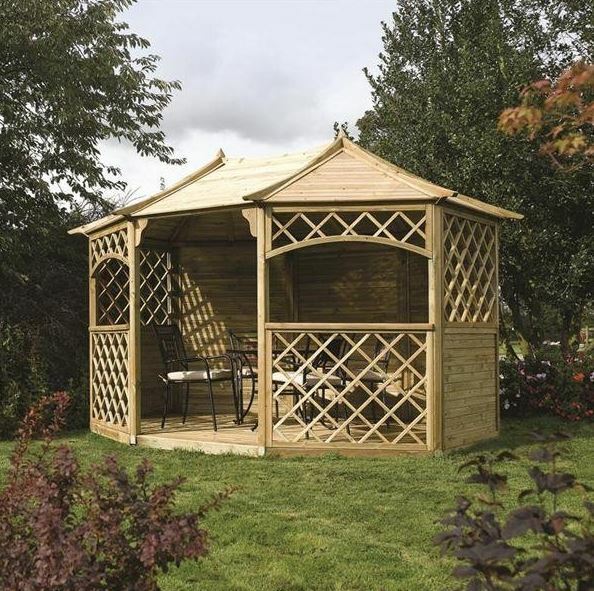 With a high trellised back adding to its classic good looks, this is among the most attractive summer garden buildings we’ve seen at such a low price. 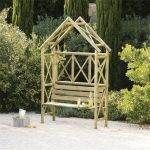 The name suggests that this is an arbour fit for royalty, and although we have reviewed arbours of a similar size that are even cheaper, this still has enough high quality features to make into our league table of the 20 best summer garden buildings. The first thing we noticed is that it’s more accommodating than many of the timber arbours we review, with a base width of 2.26m and a base depth of 1.20m, with the pitched roof reaching a maximum height of 2.10m. What we particularly liked about the clever design is that it’s been made to fit into a corner, and the front of the seat itself turns at a right angle, making it possible to sit four people on it without it taking up a lot of space in the garden. 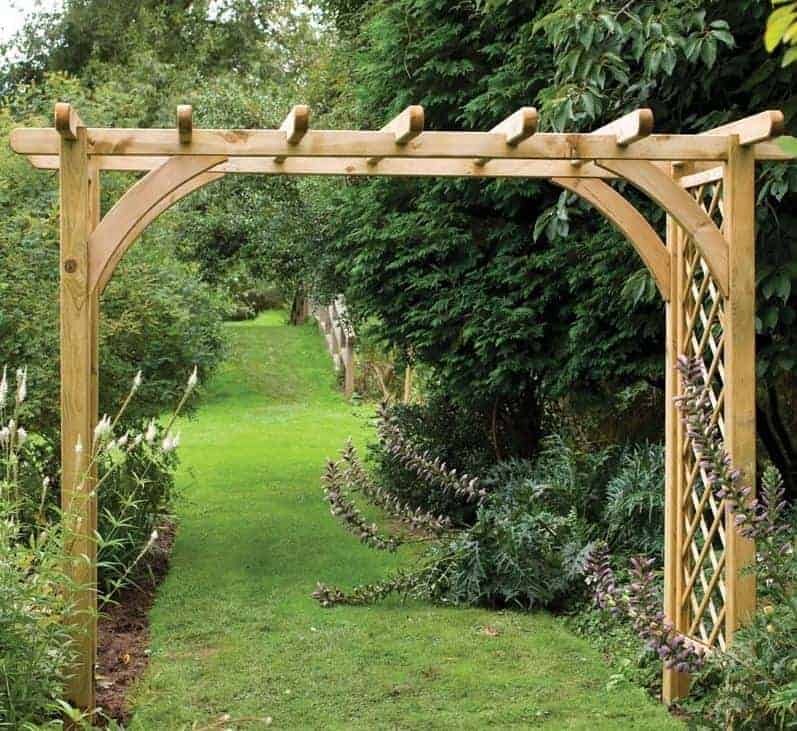 This then is a perfect space saving arbor, and with the back dominated by trellising it’s also a very good looking garden structure. 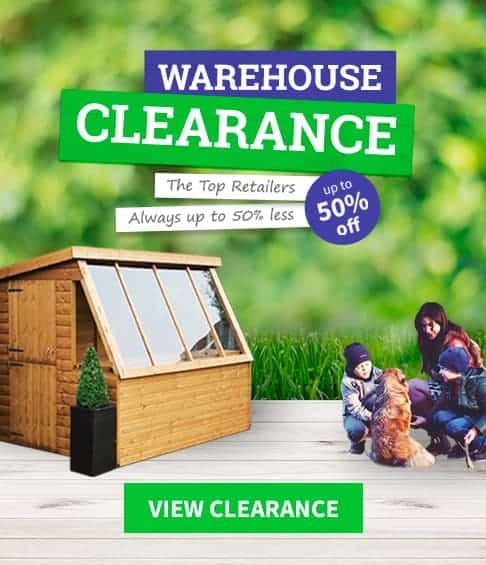 With the pressure treated timbers guaranteed for a 10 year period, it’s only the price in excess of three hundred pounds which stops us rating it even higher in our list of the very best summer garden buildings available online today, and even at this price we feel it represents reasonable value for money. This is the most expensive of all the arbours featured within our league table of summer garden buildings, which accounts for its relatively lowly position, but it’s also one of the most attractive that we’ve seen and with all the timbers being pressure treated and protected by a 7 year anti-rot guarantee as well it should keep its good looks for a long time. 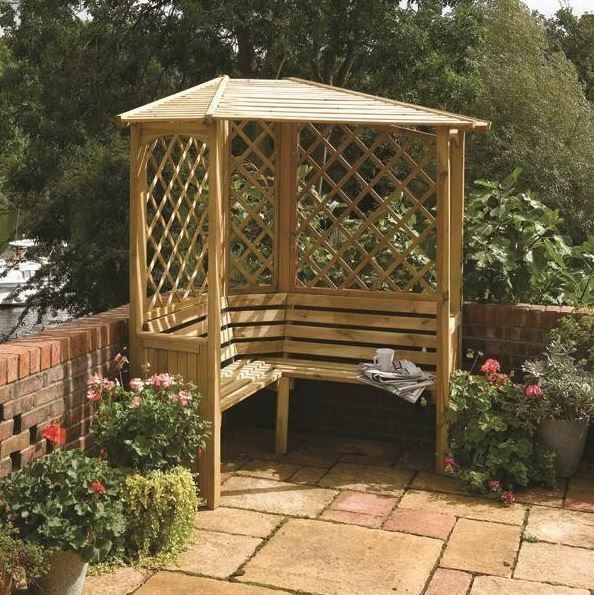 Once again this is a corner arbor, which makes it ideal for those with smaller gardens or those who don’t want to use up too much space on a garden structure. Like the Balmoral model above it, this also features a right angled split seat, meaning that you can seat more people than its base dimensions of 2.50 x 1.73m suggest. It has a unique look which we really liked, as whilst the seating is slatted the walls of the arbour are solid, with the exception of two cut away sections that act as windows. When painted or stained in colours of your choice, which is something that we recommend with all unpainted timbers to prevent the UV present in sunlight from fading them to a silvery grey colour, these summer garden buildings can become a much loved garden feature that might turn your neighbours green with envy. 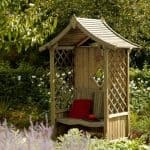 This is a walled timber gazebo that’s full of character, although it is also the most expensive of the twenty summer garden buildings on our list, which is the only reason that it finds itself next to the foot of our WhatShed league table. 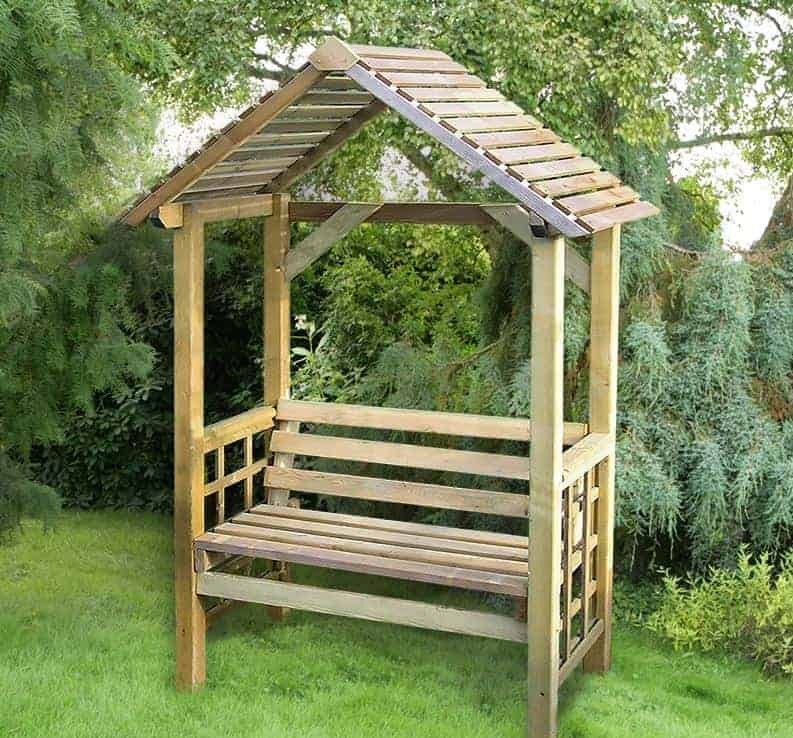 If you asked people to draw a traditional gazebo, they’d probably draw something like this; it has six sides, with trellis work on half of them, along with a slatted apex roof that rises to a spired peak. We found it very eye catching, so if you love traditional garden buildings and don’t mind paying a little extra for them then this should be on your shortlist. With a base width of 2.80m and a base depth of 2.40m there’s enough space to comfortably seat four people, so it could makes a great place to sit and watch the world go by with a friend or family member. What we particularly liked, along with the striking design mentioned above, is that all of the timbers have been pressure treated, meaning that this joins the ranks of summer garden buildings covered by a 15 year guarantee against rot. Because this initial treatment is so long lasting, it also means that there isn’t the need to add annual preservative treatments, saving the owner time and money over the warranty period. A pergola arch can make a great entrance to a garden, or it can function as a gateway between two separate areas of a larger garden. This pergola from Arbour-Plus is both sizeable and durable, and although it doesn’t have the most eye catching design in its initial undressed form, it can be brought spectacularly to life with the right plants growing across and around it, and as it also represents very good value for money with a price tag of just over two hundred pounds this is enough for it to claim the final spot in our WhatShed guide to the top 20 summer garden buildings. There are a few things that differentiated this flat topped pergola from many others that we’ve reviewed, and the first thing was the generous dimensions of 2.70 x 1.36, with a height of 2.45m. With trellised sides, it’s an ideal home for climbing plants such as ivy. We also liked the rounded supports that give the structure extra strength, as well as the 15 year warranty against rot that the manufacturer has been able to supply thanks to the pressure treatment that all the timber has been given. 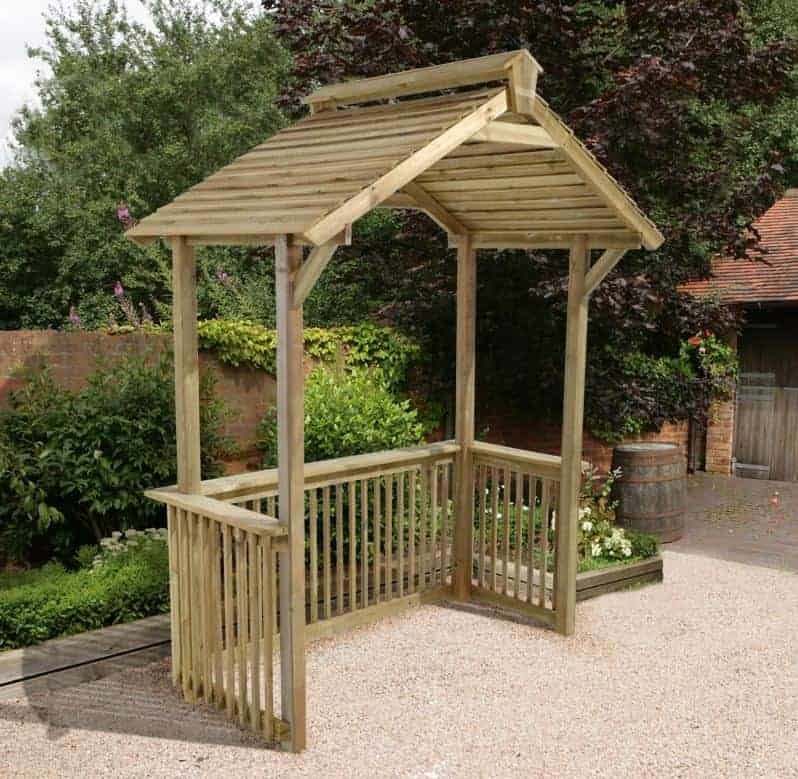 This then is a worthy way to close our league table of the best summer garden buildings, and a great choice for people looking for a low cost yet high quality pergola.